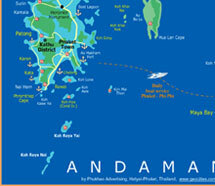 Phuket is 480 miles (800 km) south of Bangkok & 600 miles (960 km) north of Singapore.Both cities are connected to Phuket Airport by 20 direct daily flights of only 1½ hours. 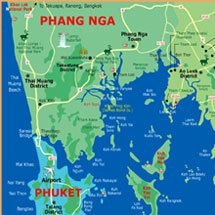 The west coast of Phuket is fringed with beautiful beaches, from the quiet to the most busy holiday's place like Patong. Marinas are shelted on the eastern coast. 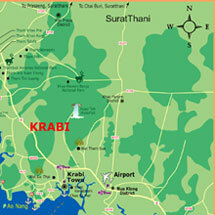 Langkawi is situated in the north west of Malaysia and right on the border of Thailand. This beautiful island is easily accessed by daily direct flights from Kuala Lumur, Singapore,or Penang. Daily flights are also available from Bangkok via Kuala Lumpur or Penang. 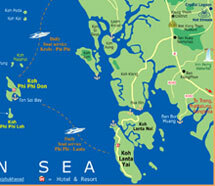 Phuket to Langkawi. There are 100's of islands, bays/lagoons with crystal clear water, full of tropical fish and beautiful coral, plus many deserted beaches with clean white sand. The cruising area of 12,000 square miles has many secluded anchorages to choose from.